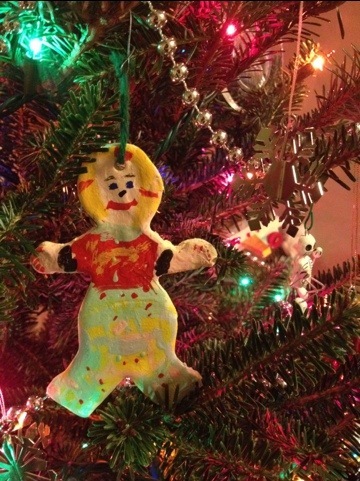 I made this ornament for my grandpa when I was five. 1. Decorating the Christmas tree. Nearly all of my ornaments are from my childhood, are gifts from friends, or have been picked up on my travels, so unpacking and hanging them is a trip down memory lane that never fails to make me smile. 3. Watching Christmas cartoons. I’ve always loved these (especially the Rankin-Bass claymation specials from the late 1960s and early 1970s) and a few years ago – back when we were still next-door neighbors – my friend Megan and I started a tradition of hosting a sing-along cartoon party. It’s coming up in just a couple of weeks and I can hardly wait! 5. Drinking Bailey’s on Christmas Eve. I have no idea when or how this became a family tradition, but it’s become so ingrained that I remember digging under the tree one year looking for package we knew (from past years) contained a bottle when we realized there wasn’t one in the fridge. 6. Adding the holiday music back to my iTunes/iPhone. In the “off season” I keep the holiday genre unchecked, but right after Thanksgiving, I load it all up. I understand that some people hate seasonal music and find it hopelessly cheesy, but I love it. 7. Drinking gingerbread lattes. Most of the year, I avoid Starbucks, but when the magical red cups appear, I become a devotee overnight. How much do I love them? I’ve written not one, but two posts about them in the past. They’re like little delicious cups of Christmas crack. 8. Participate in “adopt a family.” When I was growing up, our church had a special tree with ornaments that listed the gift wishes for needy members of the parish, and picking out these presents was always a part of our holiday shopping. It’s a tradition I’ve missed over the years, since I’m no longer a churchgoer, but this year my colleague Julia invited a bunch of us to join in with her. I’m excited for the opportunity to make someone’s Christmas brighter – and we’re having some extra fun with it, too, by having a wrapping party at the office on Friday. 9. Getting Christmas cards. I’m not gonna lie – I mostly still send out cards just so I get them in return. I’ve always loved getting everyone’s annual updates, and I hope it’s not something that fades away now that we’re in the always-connected Facebook world. 10. Waiting at the top of the stairs. This is a long-defunct tradition, but remains one of my fondest holiday memories. When we were kids, we were not allowed to go downstairs on Christmas morning until Dad had gone down first, to “make sure Santa came.” As an adult, I now understand that this was my parents’ way of keeping the chaos on a time schedule they could live with, but I still remember that giddy feeling of anticipation as Dad headed down. What are your favorite traditions? And what have I forgotten? I guess THE “apple” did not fall far from the Christmas tree!! Love your whole list 🙂 (except I leave my holiday tunes included in part of the iTunes shuffle. I like ’em that much and even one or two in July make me smile….. I love your list! To your #1 I would add the hikes in the snow to chop one down. We love sharing the stories behind each ornament. My best #4 is in northern Pensacola hands-down! Sometimes we do #8, but the family has rallied behind Operation Christmas Child. Kiddos really like it. I am with you on #9, and since I’m one of the who doesn’t FB, you’ll likely coontinue to get cards from us. Limiting to 10 is sooooooo difficult! It’s too tough to choose between childhood favs (watching a hydrated Santa maintain his balance on the firetruck that came through the neighborhood on Christmas Eve, Grandma’s colorful – but not always tasty – cookies), and stuff we’ve got going on now (the Hollidazzle parade definitely makes our top 10, as would the neighborhood Christmas play, not so sure all of the Norweigan stuff would except for lefse). Can’t believe I almost forgot to mention this…I think it started b/c of Susan, but we got to open our gifts to each other (sisters) on Christmas Eve, everything else was Christmas morning. Now as a family, we all open one gift on Christmas Eve (pajamas), so we coordinate Christmas morning. 1. We havent put our tree up, and I’m chomping at the bit! 2. Yay, cookies! I’m going to a cookie swap on the 17th, lots of baking to come. 4. Bayonne! It is excellent, used to go there every year for Wigilia. VA has some great ones too, let me know if you want to go. 9. I haven’t even taken our card picture yet. sigh.